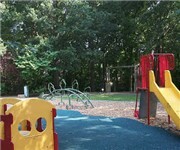 "The park had brand new equipment and surfacing installed on June 5, 2010. The photo is of the old equipment. Photos of the build day and some shots" - Jennifer S.
How Would You Rate Burch Avenue Park?